Stainless Steel vs. Non-Stick: How To Choose? →Stainless Steel vs. Non-Stick: How To Choose? Are you in the market for new cookware or bakeware and are trying to decide which one is best for you? Besides choosing between the many brands, price points, and metal options, another question you need to consider is whether to choose stainless steel or non-stick. 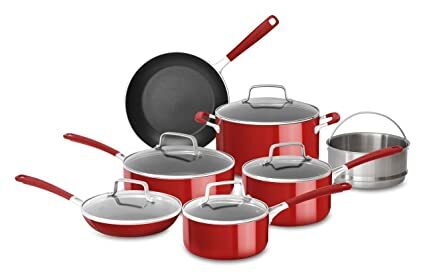 Most non-stick cookware and bakeware is coated with Teflon, a chemical coating that prevents foods from sticking to the surface of the pot or pan. The Teflon coating on non-stick pans makes them better for low-fat cooking, since you don’t have to add any butter or oil as a preventative measure against sticking. Non-stick pans are also ideal for cooking delicate foods like eggs or pancakes, which fall apart if they stick to the pan. Stainless steel cookware does not have a coating on it, which means that food does sometimes stick to it, especially if you don’t coat the pan with butter, oil, or another type of fat. Non-stick cookware prevents food from browning, which can result in a less flavorful dish. Many recipes for meat call for browning or searing, as well as using the brown bits stuck to the bottom of the pan for gravies and sauces. Non-stick pans are not ideal for this type of recipe. On the flip side, non-stick bakeware is often preferred by bakers because breads, muffins, and pastries retain their lighter, more appetizing, color and taste. Stainless steel pots and pans allow foods to brown, or caramelize. Caramelization occurs when sugars in a food turn brown when exposed to high heat. For many cooks, the best part of cooking meats or vegetables is the caramelization, because the browned sugars create additional flavor. The Teflon coating on a non-stick pan is not as durable as a stainless steel pan. High-quality non-stick cookware can last a long time, but only if you take the right precautions. You must be careful not to use sharp utensils when cooking with non-stick pans, or you risk scraping away the Teflon coating. Washing non-stick pans also requires the use of soft cleaning products. Stainless steel is so durable that it is used in the production of many household items, like appliances, faucets, and silverware. Since stainless steel cooking surfaces do not have a delicate coating on them, you can use any type of utensil when cooking, or when cleaning them. If you hate kitchen clean-up after dinner, stainless steel pots and pans are your friends; they are dishwasher safe. Not all non-stick cookware can go in the dishwasher, though, so read up on the specifics of each non-stick product before purchasing. The main chemical in the Teflon coating on non-stick cookware has a high melting point, so many people consider it safe to use for most cooking. Unfortunately, it begins to break down and release particles when heated to temperatures above 500 degrees Fahrenheit. Studies have shown that when Teflon is heated to 680 degrees or more, six toxic gases are released, two of which are carcinogens. If inhaled in large amounts, these gases can be harmful to humans. If inhaled by birds (as in, your pet, if you have one), the fumes can be deadly. Good Housekeeping did a test to determine how easy it would be to overheat a non-stick pan on a typical household burner. The testers were surprised to find how quickly both lightweight and medium weight non-stick pans could reach temperatures upwards of 500 degrees. 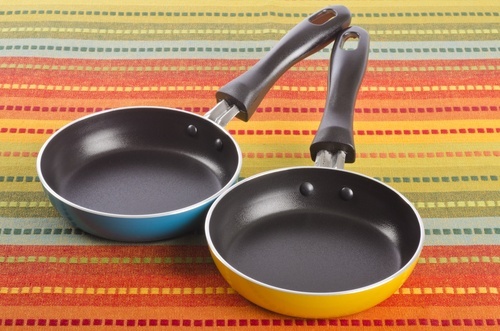 Cooking with Teflon-coated pans doesn’t mean that you’re at an automatic health risk. It does mean that you need to be extra careful when heating non-stick pans. Even the latest ceramic non-stick coating technology does not allow for maximum heat when cooking. Is adding oil or butter to my cooking going to be a problem for my diet? Does caramelization on my meats and veggies matter to me? ​How important is it that I be able to throw my pots and pans in the dishwasher? ​Do I cook with high temperatures often? These simple questions should put you on the right track to deciding between purchasing stainless steel or non-stick. If you still have more questions about stainless steel vs. non-stick, feel free to leave a comment below and we’ll do our best to answer it for you.